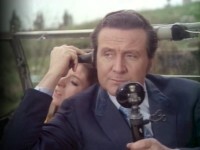 Steed returns to his flat to find it awash with postcards, and Tara bearing a gift: an inflatable dinghy, which Steed unwittingly inflates. Mother's agents are turning up dead, one after another, prepackaged, gift-wrapped and dumped in a graveyard. Remak, a suspected agent-killer, proves to be more efficient than any human ever could—perhaps because he isn't human (Remak: Remote Electro-Matic Agent Killer). You'll notice that the credits in a lot of Tara King episodes, rather infuriatingly, list the guest cast without identifying their characters. Pete Stampede has been trying to do something about this, so here are the "and" characters for this episode (in brackets). Acronym Alert: REMAK is the Remote Electri-Matic Agent Killer. Haberdasher Aske's School, Elstree, is once again the principal location. 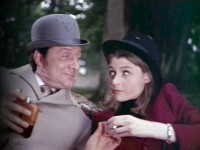 Steed and Forbes share a nip of Napoleon, "special reserve" (above), before dealing with a gunman who has them pinned down.